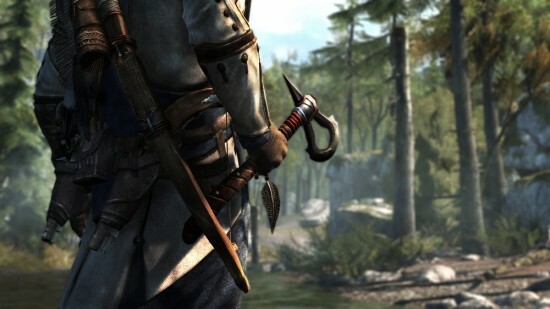 I’d be remiss to mention the living world of Assassin’s Creed III and not mention the wilderness. Although no one called the wilderness between Boston and New York the “Frontier” (thanks Colin Moriarty for pointing out that misnomer), the woodland areas have a feel all their own that is new to the Assassin’s Creed franchise. While previous titles had sprawling cities, the nature between them was fairly sparse. 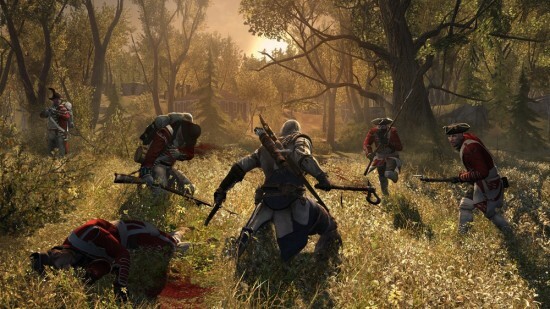 Assassin’s Creed III has miles of forest that never looks like it is repeating itself. This is also possibly because the seasons change and seeing an area under the cover of snow may feel completely different than seeing it during the summer months. As a result, it never feels like Connor is traversing through cookie cutter repeated textures and designs but a natural world that could really exist. The story of Assassin’s Creed III, I have to admit I have mixed feelings on. But let’s start with the positives. The first of which is the new setting. There was only so much time that could be spent talking about the church or the goings on in the Renaissance before it was starting to wear out its welcome. So changing it seemed like a must. But choosing the Revolutionary War in colonial America was something inventive because the number of games that have explored this time and were memorable enough to matter can most likely be counted on one hand. As expected, Connor interacts with some of the most notable men of this time and is actually there for some of its momentous occasions. Players find themselves privy to hearing the “Don’t shoot until you see the whites of their eyes” speech as well as the signing of the Declaration of Independence. One of the other strongest aspects of the story is that there isn’t a cut and dry “Good” versus “Bad” side to the story. Even though history books may teach first graders the story of the American Revolution with rose tinted glasses, the founding fathers were flawed men and this is actually addressed in the game. The weaknesses of George Washington as a leader are explored. Also, there is a very strong focus on the hypocrisy of men fighting for their freedom while at the same time engaging in the slave trade. It is rare to see a game that seems from its advertising that it would be so “pro America” to actual take a hard and unbiased look at the mistakes the country made as well as its successes. There are times though that the developers took certain liberties with history in order to help make their story work. One of the most notable is that of the Boston Tea Party. History tells us of a group of between thirty to one hundred and thirty men dressed as Mohawk Indians (which is Connor’s tribe) throwing crates of tea off three ships in Boston Harbor. The game portrays this as a large riot at the docks with a group of only a few men (none of whom are dressed in Native American apparel) tossing crates off the ships while battle an onslaught of British soldiers. It just feels like a very strange choice that a game that has paid so much attention to history and keeping certain aspects very accurate to choose certain times when they just ignore very important facts about specific events. Another issue with the storytelling is the momentary bursts of conscious from Connor. During the Revolutionary War, he kills probably more British soldiers than anyone else involved in the conflict and in brutal ways. He gets involved in skirmishes and kills without remorse. But, there are a few times when tactically he knows killing someone is the right thing to do but is morally opposed to it. This conflicting personality loses a little credibility, especially with Connor being a brand new character to the series. Desmond’s story is a whole different issue. Just as things start to get heated between memory sequences, players find themselves ripped out of the animus to the present day where they have to capture power sources to unlock a door from the First Civilization. These real world instances definitely hurt the pacing of the game and feel like they would have been better off if reworked and done entirely at the end, much like Desmond’s Coliseum level from Assassin’s Creed: Brotherhood. The end of the game also hits players with a lot of information all at once, all of which fits into the larger overarching story but is still a lot to take in at once. Ultimately, it is the final decision made by Desmond that is most unnerving, not because of the choice he makes but in the speed and manner in which he makes it and that the player has no control over the decision. Much like earlier during one of Connor’s battles where one would think Connor would have tried to find another way but instead just makes a killing blow, it seems like moments like this should have had some element of choice to it. Along with the story, there are tons of side missions for players to encounter. There are tons of hunting opportunities with the wildlife of 1770’s New England as well as trading and crafting goods. None of these are essential to the game though as doing them doesn’t greatly affect the progression of the player in the main story missions. Most upsetting is that many of the side missions are not even really acknowledged throughout the game unless a player finds them on their own. Going through the game, I made it all the way to the last story mission before discovering the general stores in town actual had weapons that could be purchased. Not having any difficulty in combat leading up to that point, I never felt the need to search out new weapons other than the ones I picked up in combat. The brotherhood style assassin missions make their way back in the game as well but are completely unessential and never even pointed out during the entire story playthrough. It is possible there are still various other mission types that I completely missed because the game gave no indication of their existence. 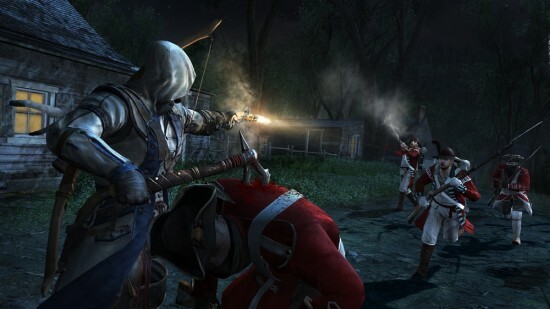 In interviews, producers and developers talked about how combat was going to change in Assassin’s Creed III. They talked about how Connor would be a more aggressive fighter and would be more like an MMA fighter than the nimble styles of Altiar or Ezio. It was also mentioned that there was going to be a more offense driven gameplay instead of players standing in the middle of a group of enemies waiting to counter attacks to get kills. While it is true that Connor’s fighting style is more hard-hitting and has some spectacularly brutal killing blows that wouldn’t have worked with previous lead characters, the method in which he delivers them hasn’t changed. Players still must wait to be attacked so they can counter in order to win in almost all combat scenarios. While the button layout has changed and it is now easier to escape from combat, the basic premise remains. Eventually, it does begin to feel fairly repetitive. Sometimes the warning indicators do not properly display depending on the camera angle which puts players at a huge disadvantage when they must get cover or grab a human shield when being fired upon. One strong positive improvement though that leads to awesome kill animations is the player’s ability to counter a double attack which puts the player into a miniature scripted animation where they use the two attackers against each other in some of the most draw dropping fatalities in the game. Surprisingly, one aspect of the game actually is worse off in Assassin’s Creed III than in any previous edition of the game. When it works right, traversing through Assassin’s Creed III is one of the game’s best aspects. Exploring the huge world contained within gives a sense of freedom that people aren’t used to. Being able to climb up what in most games would be unscalable walls or leaping from branch to branch in the forest is just pure fun, especially in the gorgeous world built around the player. But every now and then, Connor just doesn’t seem to want to do what he is supposed to. Without rhyme or reason, there are just times when he refuses to jump up and grasp a ledge in front of him or he will decide to just jump off with nothing below to grasp for to catch himself. It doesn’t kill the game’s fun but will become a nuisance, especially when trying to escape from combat, tailing a target or trying to catch someone fleeing. While not a game breaker, it certainly can be frustrating since previous Assassin’s Creed games were able to handle it better in many instances. By no means is Assassin’s Creed III a bad game. There are tons of fun and engrossing moments to play through and experience. But every now and then, certain design choices or gameplay flaws pop up that momentarily pull the player out of the world. The most frustrating part comes from the fact that we know they can be done right and HAVE been done right in previous Assassin’s Creed games. Being that this game was worked on makes those flaws even more glaring. 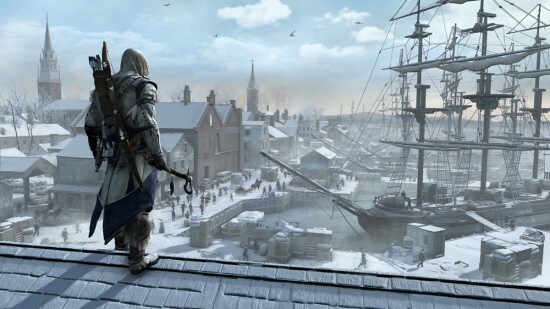 At the same time, Assassin’s Creed III has a rich world both with gorgeous visuals and being full of life. If a player decides to take on every task in the game, it can easily encompass fifty or more hours of gameplay. Even though the gameplay and certain aspects of the story do have their flaws, the title is still a must for those who have followed Desmond, Altair and Ezio this far. We just hope that Ubisoft is able to listen and make adjustments to help smooth out the experience in future titles (and yes, there will be more). Have you ever thought about adding a little bit more than just your articles? I mean, what you say is fundamental and all. But think about if you added some great visuals or videos to give your posts more, “pop”! Your content is excellent but with images and video clips, this site could undeniably be one of the most beneficial in its field. Great blog!